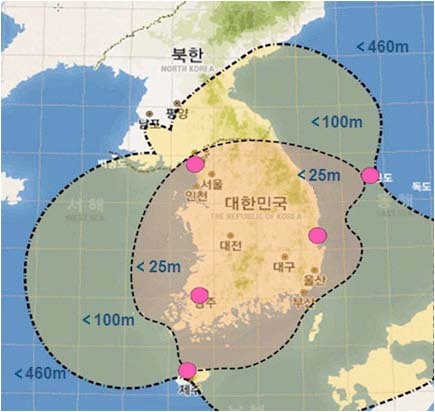 Backed by a $17-million, nine-year publically funded budget, Korea has launched an inter-institutional National GNSS Research Center (NGRC) with an ambitious agenda of projects to advance the Asian nation’s role in the field. The center is headed by Sang Jeong Lee, a professor of electronics engineering at Chungnam National University (CNU) where the NGRC was established last November. The NGRC includes five laboratories, the directors of which will comprise the center’s steering committee along with Lee: GNSS Architecture Design, Changdon Kee, Seoul National University; GNSS Signal Structure Design, Jae Min Ahn, CNU; Satellite Constellation Monitoring, Moon Beom Heo, Korea Aerospace Research Institute (KARI); Anti-Jamming Signal Processing, Gyu In Jee, Konkuk University; and Convegence Technology, Tae Gyung Sung, CNU. In addition to the organizations with which the steering committee members are associated, other universities and institutions, such as the Korea Research Institute of Standards and Science (KRISS) and the Electronics and Telecommunications Research Institute (ETRI), are participating in the NGRC, along with several industrial companies. The NGRC will devote its first four years to setting up a GNSS research and development infrastructure, followed by a second phase (2014–2018) that will develop core GNSS technology and capabilities for product prototyping and validation. Phase I will initiate such projects as GNSS signal structure and miniaturized atomic clock design, signal quality monitoring technology, adaptive array antennas, jamming detection and isolation technology, and a Korean GNSS architecture design. Second phase projects will launch studies on such topics as wide-area differential navigation, signal encryption and authentication, integration of multiple radio-positioning systems, and jamming-resistant software defined radios. By 2019, the venture intends to have transformed itself into a self-supporting corporation as an R&D center for GNSS and convergence technology. In addition to the Korean government support, the NGRC has a $2.2-million budget of industry projects. Lee founded the Korea GNSS Technology Council, which he has chaired since 2002, and is a member of the Inside GNSS Editorial Advisory Council.